Natural way to energize your work day. 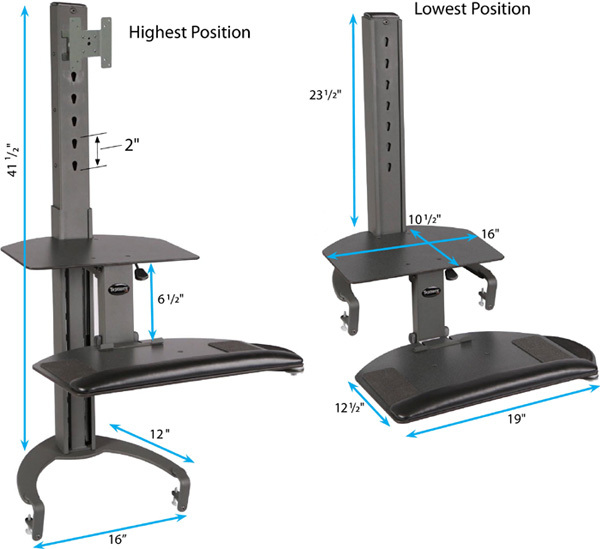 Healthpostures 6300 Taskmate Go sit stand desk is a sleek, cost effective way to enjoy a healthy energetic work-style. Now you can effortlessly move from a sitting position to a standing position improving productivity and comfort and have the freedom to move whenever you like. The Taskmate Go sit stand desk will not only keep you energetic and focused throughout your workday, it will also help you burn calories, lose weight and alleviate back pain. It’s all in a day’s work for the Taskmate Go. Depth from monitor to wrist rest 22"
Max. LCD size single 30"
Max. LCD size dual 24"
33" x 20" x 16"
Desktop Thickness Range Minimum 7/8" to maximum 2"